Update April 2011: Since this was one of my very first posts, I've updated it with some newer pictures of the finished product. 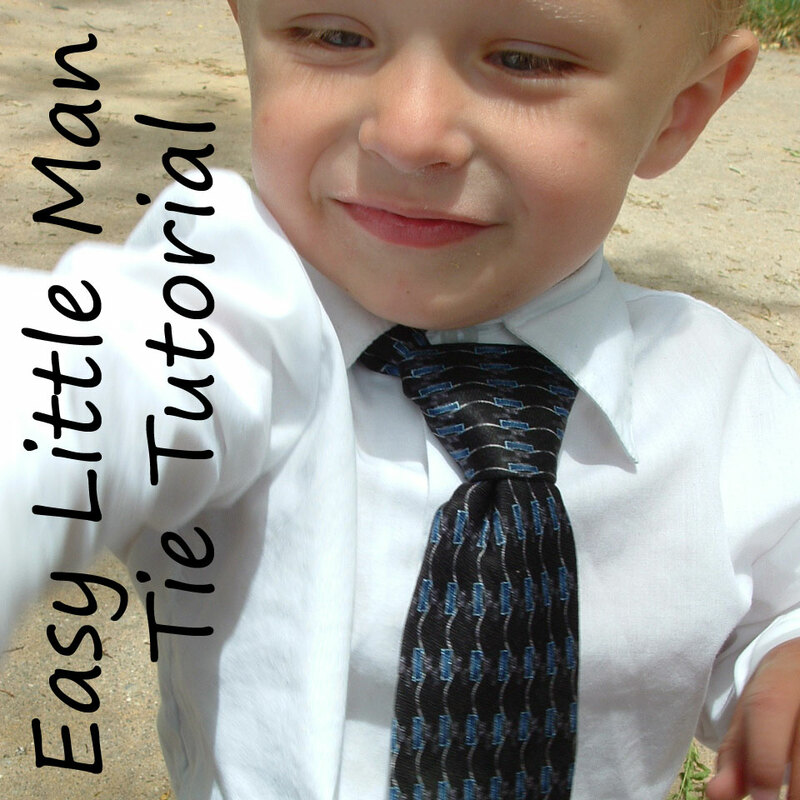 I've used this tutorial several more times, and the ties always look great. Little Brother hardly notices it's on, so he's not pulling at it...and they don't come off since they're held on with elastic instead of a clip. Because afterall, you want your Little Man to look dashing even when he's playing in the dirt. I found this tutorial for making baby ties on sei Lifestyle, and loved it. 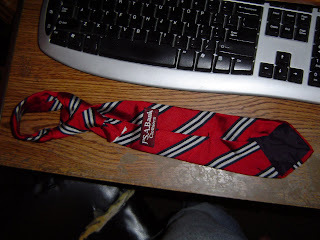 I got this free box of funky ties from someone on FreeCycle a couple weeks ago, so it was perfect timing. 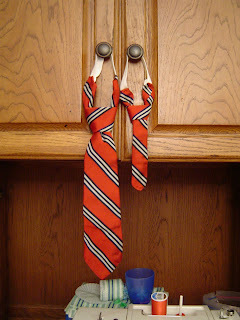 I've been wanting to try this for a week or so, but whenever I get a chance my husband hasn't been around to tie the tie for me...so I looked it up online. I found this site and ended up with this. (One note...some ties are wider than others. The one I used was on the narrower side. Some are wide enough that the back part could be used for a toddler/young boy, and some the back is only wide enough for a baby tie...and for some of the wider ones, they'd be too wide to use the front for a toddler, but you could make one for an older boy with them.) I followed the directions to the "Half-Windsor" knot doing it with the small end instead of the big end. As the instructions in the original tutorial say, I sewed the knot well in place by slip stitching just about anywhere I could. 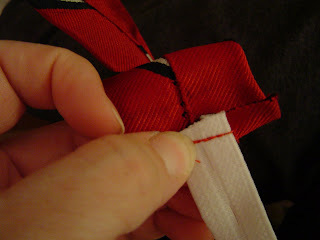 Then I cut the "neck" part as well as the extra, so I could add elastic. 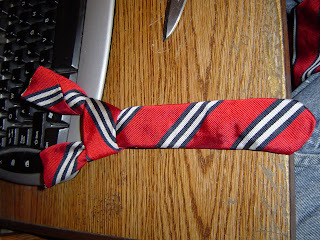 One thing I wondered when I saw the tutorial was...could you make a second matching tie?...and the answer is yes...as long as it's for a small child. There's not enough to make another one for Dad...unless Dad is really REALLY short. 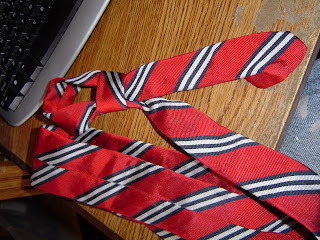 I got this when I tied the rest of the tie. The knot is a little thicker than I'd like because it's actually further down the tie than it would be tied for an adult, but it works. I decided to make these for Patti's boys...my awesome friend who helped me with the puppet theater, so I took the bigger one with me when we worked on the puppet theater to see how much we would need to shorten it. I figured I could trim a little off the biggest part, fold it under and slipstitch it...but Patti liked it just the way it was. I finished them up with the elastic just a bit differently than they did on sei Lifestyle. 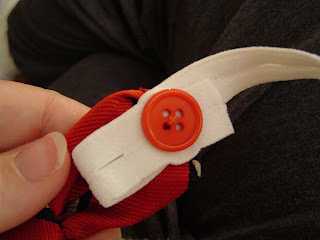 I used buttonhole elastic. 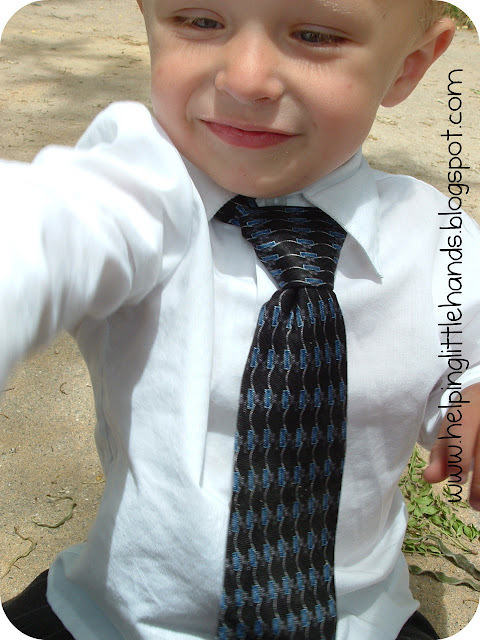 I figured thatway, it would be more adjustable and could fit the boys longer...especially the older one since this tie was a bit big for his size. I went inside and trimmed the interfacing down about a quarter inch and then trimmed the corners of that off. This will reduce the bulk a bit. 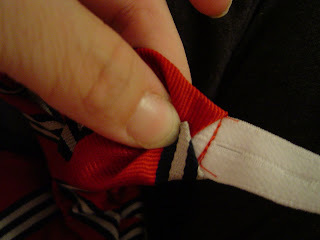 I sewed the elastic to the FRONT side of one end with about a quarter inch seam. 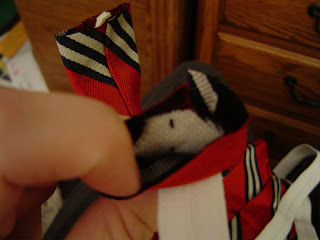 Fold the seam allowance against the tie. 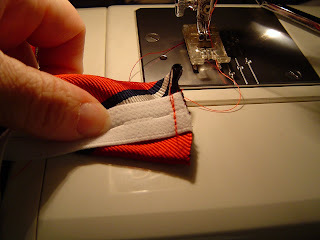 Fold the corners over and secure it with some hand sewing. This mostly eliminates any raw edges. It will look like this on the front. 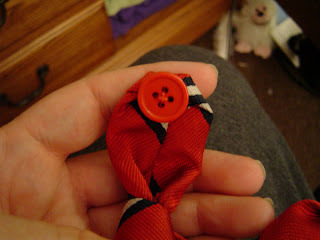 On the other side of the tie, sew a button on the back side. 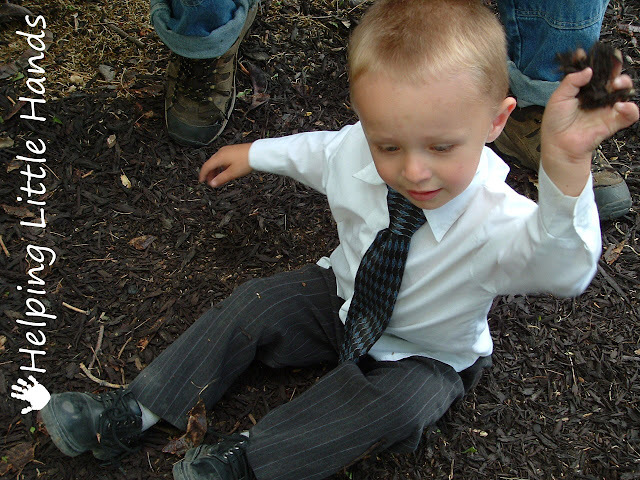 Cut the elastic an inch or so longer than you think it needs to be so your little guy has some growing room. You can take the extra elastic and fold it back on itself, so it won't show when he's wearing it. You should be able to put the tie on and off him without unbuttoning the tie. You'll only need to mess with the button if you need to adjust the size. I also used a few extra hand stitches here and there on the back to get things to lie flat. You can see in some of the pictures where on the back at the bottom of the ties they were a little creased, but a few stitches tacking those down helped a lot. They didn't go all the way through...just enough to catch the interfacing. I made a tie like that for Josh - Katie's wedding with the green ties. 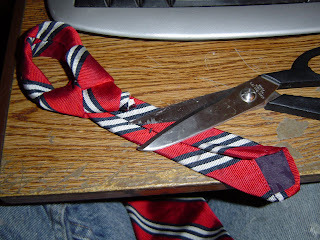 I don't think I used elastic, though - just made a smaller tie that could be tied the big-boy way. Started from the "wrong" end of the tie so it wouldn't be so huge. Thanks Polly! I just might use this for some Christmas gifts. How adorable is that!!! Oh how i miss those baby boy days!!! What a cute idea! Thank you so much for sharing!!! I love this idea! I need a tie for my little guy this weekend... hmmm, maybe I'll have to give this a try. What a great idea! And what a heart-breaker too! Cute!!!! Perfect for my little man. Thanks for this great idea. Thanks for sharing at For the Kids Friday at Sun Scholars! That's awesome~ I'm going to give it a try! I love this! 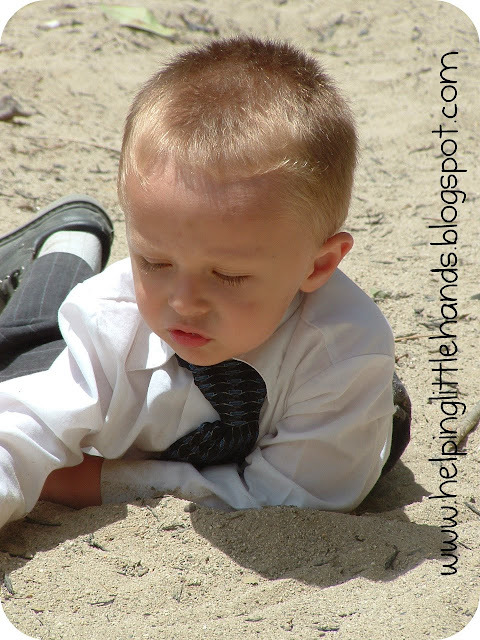 I am featuring on my blog today! Very cute idea - thanks for sharing all of the pictures as well. 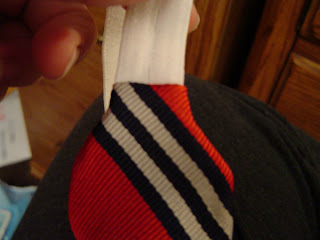 Any recommendations on places to purchase different fabrics to make matching ties? So I found your blog and the more I looked around the more I realized that you must be my double! My name is Polly too (Pollyanna actually) I love quilting and sewing, I love Harry Potter, and making felt food. I noticed a temple quilt in your gallery so we may have our beliefs in common too. Just letting you know that I am an instant fan! Thanks for the cute tie tutorial!